Looking to adopt out my two birds to a new loving home at no cost. Overview of these captivating creatures in the wild and in our homes, and some and Interesting Facts! Birds - Our Wild Friends! Who doesn't want to experience the colorful and fun creatures as close to home as possible? There is a lot you can do to invite them in. The stunning Central American Purple-throated Mountain-gem are second to none in terms of natural beauty. They are one of the major tourist attractions in Costa Rica, where ecotourists come from afar to experience these delightful creatures in their natural habitat. However, the stunning Crimson Sunbirds (and other sunbird species) from Asia have a lot in common with the American hummingbirds, such as small size, color plumages, and long skinny bills that are perfectly adapted for retrieving nectar from flower buds. Dusky Lories aka Banded Lories or "Duskies" are unlike other parrots species. Their main diet consists of flowers, nectar and pollen. They are in demand in the pet market because of their striking beauty, but their loud natural vocalizations should be considered. The North American Chuck-will's-widows are far from " usual." They have large, gaping mouths that allow them scoop up insects in flight. These nocturnal (night-active) birds were named for their repetitive, loud, whistled "chuck-will's-widow" calls that are often heard at night. The Crimson Sunbirds are tiny birds found in Asia. They have a lot in common with the American hummingbirds, such as small size, color plumages, and long skinny bills that perfectly adapted for retrieving nectar from flower buds. 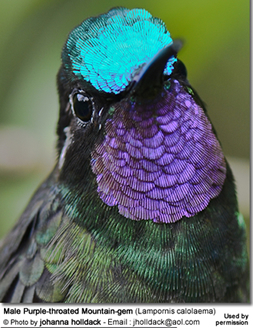 Still, the stunning Central American Purple-throated Mountain-gem are second to none in terms of natural beauty. They are one of the major tourists attractions in CostaRica, where ecotourists come from afar to experience these delightful creatures in their natural habitat. This image by Wildlife Photographer Julian Robinson from Australia of a Superb Parrot - aka Barraband's or Barraband's Parakeet - is simply extraordinary. 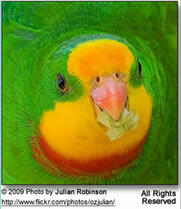 Sadly these parrots are at risk of extinction. Only about 6,500 adults are believed to have survived in the wild. Conservation measures are being implemented to make sure that future generations will be able to enjoy these remarkable parrots in their natural habitat. 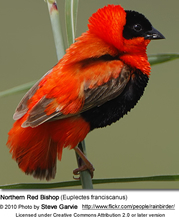 The African continent has their own avian treasures - such as the Northern Red Bishops. These brightly plumaged finches are best known for the males' habit of weaving complex done nests. 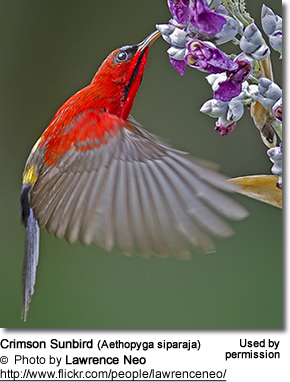 They are also known as Franciscan Bishops, Northern Red Bishops or West Nile Red Bishops. These finches that are best known for the males' habit of weaving complex dome nests, as well as their entertaining courtship displays to attract potential females. This delightful Trumpeter Swan cygnet was beautifully captured by photographer Mary Margaret. Trumpeter Swans were named for their deep, sonorous calls. These majestic white swans - with contrasting black bills, feet and legs - were hunted close to extinction by 1940, as they feathers were in demand for fashion wear (such as hats), their largest flight feathers were used for quill pens and their skins were used for ladies' powder puffs.